Mama and Baby Bear are back, enjoying a summer evening of foraging enlivened by an enthusiastic game of hide-and-seek. As they watch bats fly from their den, Baby Bear asks Mama where they go. “They are going to look for food,” she replies, and the pair sets off to do likewise. On successive spreads, Mama “sniffs the warm night air” and eats berries, catches a trout, drinks water, and munches dandelions, all the while playing the familiar game. Whenever “she looks around, / Baby Bear is nowhere in sight. 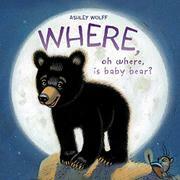 / ‘Where, oh where, is Baby Bear?’ calls Mama.” Wolff hides Baby Bear in plain sight for children to spy. Each time he reveals himself, the cub identifies both an element of his woodland habitat and an English preposition to learn about. “Here I am, Mama…. / Inside the mossy log.” He also hides “up” in a birch tree, “behind” a waterfall, “between” some cattails, and “on top of” a boulder, silhouetted against the rising full moon. Mama’s gentle indulgence of her cub’s miniexplorations exemplifies confident parenting. With her firm “Come along now, Baby Bear,” the two retrace the evening’s feeding (and hiding) spots. (Wolff adds some fresh prepositions, too.) Wolff fully masters her media—linoleum prints luminously enhanced with watercolor. Children will pore over these pages, identifying creatures of woodland and meadow.